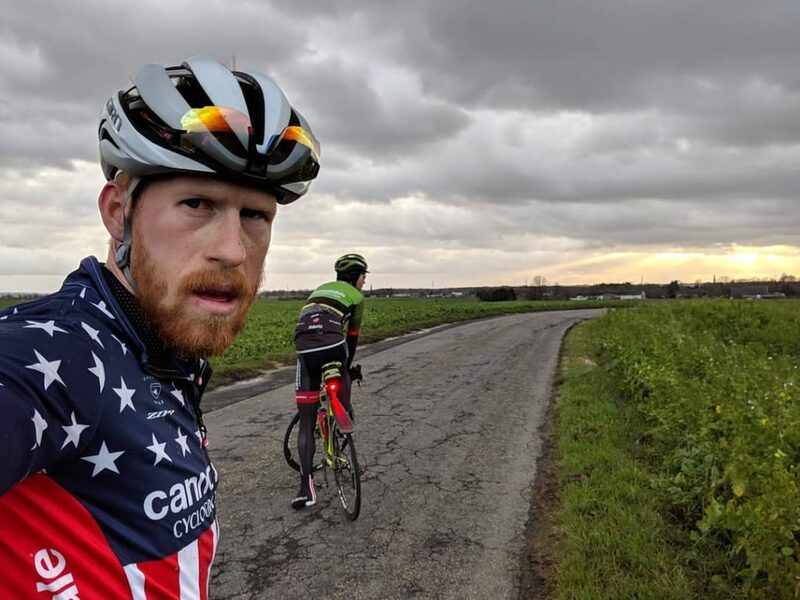 The cyclocross season may be over for now in the United States, but the top riders in the sport are still going strong, gearing up for the UCI World Championships on February 2nd and 3rd in Begense, Denmark. To cap off our Real Cyclocross series (for now), and to check in on one of the 2019 U.S. World’s team representatives, we jumped on a call with three time U.S. Cyclocross National Champion, Stephen Hyde. We had a great time catching up, getting his Nationals play-by-play, and digging into the details behind his preparation for the last race of his season. So obviously the cyclocross season in the U.S. is over. And I’m not sure if you heard, but you won Nationals. I know it’s hard to explain a feeling, but can you try to sum up what it was like to win that race after the season you had? So you almost talked yourself right out of it. So going through the race, it was just brutal. And I was, in theory, unprepared for it. And all of that, not even just that year, that season, but all of the years of just doing the extra work and thinking harder and trying to add more. All the extra stuff that I do to be ahead of the curve. All of that just really came into play. And then all of the patience that I’ve learned from falling down so many times and making those comebacks. It was just like that. It was like the whole season in one race. I’m like, “Okay man, it’s cool. Just keep plugging.” I’m watching Curtis ride away from me. And then I wasn’t really doing anything different, but then he was coming back. And all of a sudden it’s like, “Yeah this is it, man. This is it.” And going into the last lap, I crashed. Over the bars, hands in the mud. And I kept going. And finally I heard someone over the intercom. “Hyde is on his way to win.” And I just thought, “No you’re not. No you’re not. Just keeping going. Don’t even think about it. You are not allowed to think you won this race until you’re on the other side of this line. 100%.” That was the most emotional I think I’ve ever been at the finish of a race. And it was unbelievable. Yeah, I was ecstatic. And to finally have Hayley there for the first time… that was pretty … yeah, I was a pretty happy guy. Whew. Well it was an incredible race to watch. And now, next up, you’re racing World’s. So where have you been hanging out? And how have you been prepping for the last race of your season? So I was in Malaga, in Southern Spain. I did some big miles. Four and five hour days, just trying to get as much vitamin D and miles on my legs as possible. Trying to get some intensity. We had a bunch of other riders there as well. All the Americans, basically, that were in Europe at the time decided to make their way over there. The Belgians go to Mallorca and Calpe. And all the Americans go to Malaga. There’s much better food there. I know what my priorities are. Ok, so there’s great food in Southern Spain. Were you enjoying it? Or are you on a really strict diet? So actually I’m not. This year has been an interesting time for me. Because for those that don’t know me, I am… is obsessive too much? I’m obsessive about certain things with training and racing. Diet is one of them. And I usually use MyFitnessPal. And I’m very dialed in with my scale and with the types of food I’m eating. This season has been very difficult in a lot of ways. And I came to a point where I needed to let a few things go in order to actually make it to the end and not drive myself crazy. So I definitely weighed the options on that and said that it’s worth it to be a little happier. And it’s worked out really well. And so on this block in particular in training, I’m not using any tricks. I’m eating to perform. And I’m eating to get the most out of my training. Granted, what I know on the macro end of things is very ingrained at this point. Ok, so back to World’s. What is the strategy in a race like that, when you’re competing against literally the best riders in the world? For me, it’s a drive to continually perform, year after year, and to see those incremental gains. So when I do my training at home, I’m not necessarily looking for the advantages in training to compete on the domestic level. My real goals lie in Europe. And it takes a lot of progression throughout the year to get to the point where I can perform on a higher level than I’m practicing day in and day out. This year was a little difficult though. The racing is changing. At the front end of those races it’s getting a lot faster. The lap time is faster on each one of those courses. So the dynamic there is changing. And then for all intents and purposes, I had kind of a crappy year. So I’m not on the form that I wanted to be on. From a confidence perspective and from a bike handling perspective, I’ve made some gains. I’m really happy about that. Every year I’ve done Worlds, I’ve increased my placing. And that’s been a real goal of mine. It wasn’t to just go from last to first in one shot. But being really, really happy with three spots or two spots or five spots. And last year I wanted to get in the top 15 and I got 15th. The year before I wanted to be top 20 and I got 18th. So all of those things really, really matter to me. And they really do push me. So this year’s goal is five more spots, finishing in the top 10. What would need to happen in this country to make it so that you can go to Europe and really perform with those riders? Realistically, absolutely nothing would happen in our country. We would leave our country and we would go live there. We’d have to build up a whole National TV network, build a fan base magically overnight. And then back it up with about 30 or 40 years of professional development to make that happen. The easiest thing we can do is get a team or two that want to sponsor riders to come live in Europe. We do it with the World Tour. It’s every road rider’s dream to go to Europe and be on that program. But with cyclocross, we have the opportunity. You don’t get that many road racers going like, “Well, I’m going to go over there and give it a shot on my own.” Because it’s not really the same vibe in that sport. It’s not really as accepted. Whereas with cyclocross, it’s very accessible and very easy to just show up and kind of wing it and do it as a tourist, if you will. But it’s also very easy to walk away from it as well. It’s harder to find investments. And I think when you do it, when you come over with your suitcase, and you just get pounded and pulled out of the race, and your equipment is just absolutely trashed and you don’t have the infrastructure to rebuild it and you don’t know the language and you don’t know where to buy groceries… you’re not integrated into the system. So it seems like this infinitely hard thing. And there’s a huge learning curve. Whereas given enough time (and I don’t think it’s as long as people think), if you take a top athlete and you put them into that situation and support them in the way that they need to be supported, then it’s very minimal. It’s literally a house to live in, a vehicle to drive to the grocery store, and a mechanic. And that’s pretty much it. And a couple of bikes. We’ll get a different outcome is riders are given the opportunity and the support to do this day in and day out. Right now, we see the ceiling and that’s it. Like, we only have to work so hard to get to that ceiling. So when the ceiling is raised, then we’ll all try to lift up and meet it. Do you think we can learn from these other countries? And if so, what’s the lesson? Once you’re done with your major racing career, do you have a role in passing this information on to people? Do you feel like you want to do that, to become a mentor and to create something like this? It’s all these mysterious truths that are just kind of common wisdom. I think it’s very American to think we have a better way to do it. And to think we’re going to do more with less, and get away with it because we deserve it and we work hard. So I think that the big information that we’re missing is that it’s a serious job. And these guys… these men and women do a lot of work. And they take it very seriously. And they miss out on huge chunks of their young lives to do this. It’s not a vacation. It’s not an adventure. Very few of them are getting degrees at the same time. It’s an all-in lifestyle. It’s extremely difficult. It’s a lot of hard work. And the training methodology is very old school. There’s nothing magic about it. So I hope that’s part of what I’m bringing back to other people, because that’s what I’m getting out of it. And it’s so much more accessible in my mind now. Right. Do you think this is one of the most misunderstood aspect of training is that people think there’s this magical thing that they can buy or somehow figure out from a book, and actually what it is, is hard work? 100%. It is 100% the American way — trying to get the best deal possible. And when you start trying to get a deal on your future, you absolutely lose out. So with that said, will that all-in philosophy work for American riders? I don’t know, because that’s an ingrained thing. I think that takes a very special person. And I’m not saying that I’ve committed so much that I’m living some stoic lifestyle. But I am certainly trying to deal with it in my own way, and also balance a little bit more of the lifestyle. Regardless of what some may think, there’s still a give and take and all that. And it’s exponentially harder when you have to spend half of your year abroad, away from your family and your friends. So I think what I would like to do, what I would like to give to the people around me, is the idea that there is no secret. And that if you want to do it as an American, you have options to do it. But it’s difficult. You have to make that sacrifice. Someone’s going to be mad at you. Your family is not going to see you. And if you’re a person that needs to see your family a lot, then you need to really think about that. It’s difficult. So I don’t know. I’d like to help find a balance for people that want to do it. And I’d like to try to find a pathway that leads to into the thick of it without compromising so much of your life. I think the hardest part is finding people to do it and then working at a psychological level to keep them in the game, keep them focused on something that’s so long-term. Right. It would seem if you’re not incredibly grounded, as you said, in that confidence that your short-term and long-term sacrifices will pay off at some point it would be very difficult. And I can imagine going to Europe and getting your face smashed in and your ego checked is an easy exit for most people. There’s a ranking system. There’s a National Champion. There are Continental Champions. And then there’s a World Champion. So there is a very well-defined best. There is one person that is best every year. And if I never make that, am I okay with that? What is the best for me? Am I okay doing absolutely everything in my life for that, if 10th is the best I’ll ever get? So you’ve devoted a lot of your time acquiring all of this information and skill and it’s taken a significant investment on your part. So what is the balance with sharing that with the people that you’re mentoring or the people that are around you, and making sure that the energy that you’re putting out is coming back or is well-spent? Maybe it’s not coming back in the exact same way, but it’s being well-spent by you. I’ve spent a lot of time thinking about that. I really have. I think that’s a constant, not struggle, but it’s certainly a point of contention within myself sometimes. I often have a hard time not putting that out there for people. Sometimes people don’t even want it, and I still have this tendency to coach unwilling people. For me, I’ve relied on so many people in my life. And things like education and degrees and so on haven’t been reliable for me. They haven’t been sources that I can rely on to get me ahead on things. I’m very much a blue-collar, learn on the job kind of person. I’m much more tactile in that way. And I have always pushed for mentorship naturally. That’s just the way I am. And I think it probably comes from my parents and the way that they raised me. They taught me that time and wisdom are the best things we have for people. And so I do get very invested in this sometimes. And sometimes, I’m invested in the wrong person, and I have a hard time dealing with that, and telling the difference between someone who is going to take that knowledge and do something with it, and someone who is going to keep saying, “Yes.,” and just sort of soak up my time. I’ve often been misjudged for having a lack of empathy. But I really feel like my empathy lies in (I think much like Al [Donahue] probably), is not really giving up on people. Giving them the benefit of the doubt no matter what. So I want to share my knowledge and to help deal with people’s lives in sport and do what I can for them as individuals. And I always have to think about this like… sure, I have done things. And I have some knowledge. But these people don’t owe me anything. And I can tell people things all day. But it’s totally up to them to do something with it. That’s an amazing outlook to have because realizing that everybody you talk to has their own blocks, has their own stuff going on, has their own history, has their own way of learning, and all of that. And it’s figuring out how you interact with a particular person. Is there something that sticks in your mind as one of the most influential pieces of advice you’ve been given by a mentor or a coach or your parents or whoever? What jumps out as something that’s really stuck? For me, there was a real turning point, and this was 100% Al [Donahue]. My whole life has been privileged, and easy, regardless of growing up pretty poor and kind of always being on the tail end of things. Always being behind in the times and not having the same stuff. Always kind of wanting more. But I’ve always had a very easy time. I’ve always been a very quick learner on things that involve physical ability. But that’s also made it very easy to jump around on things, and kind of get what I want out of them and then take off. When things really started to get hard with me in bike racing, I was living with [Al] at the time. I was having a really hard time. And I didn’t know what to do. I was dealing depression and coming to terms with how long I’d had it. And not knowing why. And not knowing why things were hard around me. And seeing this really long road ahead to becoming a professional in bike racing, and just really being one foot in, one foot out on it. He got you with a little reverse psychology. That changed my entire life. Really. 100%. Final question, and it’s nice and stressful. What is your post-superstar life plan? Do you see yourself coaching once your racing starts to slow down? What’s your vision for the next thing? I would like to do something more broad than just coaching individuals. In my post-ridership, I’d like to run a program that would actually put American riders into the European scene. I had a very unique experience in the way that I was brought into cycling, from a mechanical background. So I’ve seen a lot of shop operation and running retail, et cetera. I also had the very unique experience of going through a thorough development program, that doesn’t necessarily focus on taking riders that are already good and giving them the means of development, but really focuses on developing psychologically, spiritually, physically, from the ground up. I think that’s a very, very unique experience. Then I outgrew that program in a way. Or not outgrowing it, but becoming a peer, and sharing that information. Moving to [Cannondale p/b Cyclocrossworld.com], a program that is absolutely, from a domestic standpoint or from a worldwide standpoint, very dialed. And then, becoming one of the best cyclocross athletes that has ever come out of the U.S. I think I have a lot of unique experience to pass on. And also working with the coach that I do, and not just having that interaction and knowledge between the two of us, but also being able to pass that on. So yeah, I would like to put all that to the test. And I think it will work one day. Yeah.